Table of Contents Next: Bissel, Clayton L.
The Bismarck Archipelago is located northeast of New Guinea and northwest of the Solomon Islands and shares the terrible jungle terrain and rainsoaked tropical climate of both. The archipelago was discovered by Able Tasman in 1642 and rediscovered by William Dampier in 1686. German settlers began moving into the area in the 1860s and Germany annexed the archipelago in 1885. Australian troops drove the Germans out in September 1914, during the First World War, and Australia received a Class C mandate over the islands from the League of Nations on 9 May 1921. The total land area is about 26,300 square miles (68,100 km2). New Britain is the largest island in the chain, with an area of 14,600 square miles (37,800 km2). There are superb anchorages at Seeadler Harbor in the Admiralty Islands and Rabaul on the northeast tip of New Britain, but only the latter had been developed to any extent by the end of 1941, with modest docking facilities and two airfields. There is also an anchorage at Kavieng on the northwest tip of New Ireland, but it was overshadowed by Rabaul throughout the war. Prior to the Pacific War, the chief economic activities were export of copra, timber, and turtle shells. Besides being jungle-clad, the islands are rugged, with several active or dormant volcanoes. For example, the anchorage at Rabaul is a flooded caldera, and resurgent domes in the harbor area emitted quantities of steam and ash from time to time. Sulfurous fumes greatly reduced the habitability of the many underground fortifications build here by the Japanese during the war. There are no significant mineral resources on the islands. The islands receive their heaviest rains during the northwest monsoon of October through April, but there is no real dry season. Tropical diseases such as malaria were common, particularly on New Britain. The native population consisted of Melanesian tribesmen, with some Polynesian blood, who had largely converted to Christianity by 1942. However, there were still rumors of headhunting by tribes in the interior of New Britain. The region produced some copra and timber but remained largely undeveloped under the Australians. Large numbers of natives were contracted as laborers, particularly since Asian immigrant laborers were prohibited. Native laborer employment was regulated to ensure that natives were properly cared for during the time period of their contracts. The Bismarcks were marked for occupation in the earliest drafts of the Japanese Navy plans for the Centrifugal Offensive, as part of the outer defense line against the expected American westward drive (Plan ORANGE). By the time the Allied South Pacific forces had completed the Solomons campaign by advancing through New Georgia (30 June 1943) and Vella Lavella (15 August 1943) to Bougainville (1 November 1943), and the Southest Pacific forces had finally cleared the New Guinea coast as far as Lae (16 September 1943) and Finschhafen (22 September 1943) and crossed to Cape Gloucester (26 December 1943), it had become clear just how formidable a fortress the Japanese had made of Rabaul. The Allies chose to bypass Rabaul, which was neutralized by air power and left to wither on the vine. The Admiralty Islands were assaulted on 1 March 1944, the Green Islands on 15 February 1944, and Emirau on 20 March 1944 to forge the last links in the ring around Rabaul. The Bismarck Archipelago encloses a body of water known as the Bismarck Sea, some 500 miles (800 km) from east to west and 300 miles (500 km) from south to north. According to Miller (1959), the Bismarck Sea received its name during the Second World War. Following the defeat of the Japanese attack on Wau in February 1943, the Japanese feared a counterattack against Lae, which had a garrison of just 3500 troops. General Imamura and Admiral Kusaka decided to move a force of 6912 soldiers from from Nakano's 51 Division from Rabaul to Lae to reinforce the garrison. The convoy (Operation 81) would be timed to take advantage of bad weather for concealment, and a large number of fighters would be standing by to provide cover if necessary. Yamamoto reluctantly consented to allocate eight modern fleet destroyers to the operation. The cargo, which included provisions and drums of aviation gasoline, was carefully distributed among the ships and combat-loaded for rapid unloading. All the transports carried numerous boats for unloading and the crews were under orders to ignore air raids while doing so. It was estimated that the troops could disembark in six hours and the supplies could be unloaded in 48 hours. The convoy would not be able to advance at much better than seven knots, but by taking the route north of New Britain, the convoy commander, Kimura, hoped to deceive the Allies that the convoy was headed to Wewak. Air cover would be provided from Rabaul, Gasmata, and Lae by about 40 Navy and 60 Army fighters, with the two services assigned separate morning or afternoon shifts on each of the seven days the convoy was expected to be at sea. Additional aircraft would raid the Allied airfields at Port Moresby and Milne Bay in an effort to pin down Allied air power. Two earlier convoys had suffered an average 25% transport losses, but the Japanese were prepared to accept the loss of up to half the transports in this convoy. However, the Allies anticipated such a move, and Allied code breakers were able to decrypt messages giving important details of the convoy operation. Meanwhile Kenney, who was dissatisfied with the effectiveness of medium- and high-level attacks on previous convoys, had ordered a squadron of B-25 Mitchells modified as "commerce destroyers." Eight machine guns were installed in and around the noses of the aircraft, and they were been modified to increase their maneuverability, turning them intopotent low-level strafers. The crews were trained in low-level attacks using an old wrecked freighter near Port Moresby as a target. When the crews dropped their bombs at 100-200' (30-60m) altitude, the bombs would skip along the surface of the water, bouncing right over the target if the release was badly timed, but hitting the hull near the waterline if the timing was good. The training was hazardous; one aircraft crashed after colliding with the mast of target hulk. After two other aircraft were damaged by debris kicked up by their own bombs, the bombs were given five-second-delay fuses. A full-scale rehearsal of a coordinated antishipping strike took place on 28 February 1943. By then the Japanese had the eight destroyers and eight transports loaded and ready to go. Conditions were judged favorable on 28 February and the convoy set out, closely hugging the northern coast of New Britain and well concealed by poor weather. On the afternoon of 1 March the weather cleared slightly and the convoy was sighted by an Allied patrol aircraft. However, the weather was still bad enough that subsequent flights that day over the convoy, including one by 7 B-17 Flying Fortresses of 321 Bombardment Squadron that had just raided Gasmata, were unable to make visual contact. The convoy was picked up again the next morning by a B-24 Liberator from 320 Squadron which counted seven merchant ships and seven destroyers. This aircraft maintained contact until about 1015, when a force of 12B-17s and 17 other bombers which pressed their attacks from an altitude of 5000 feet (1500 m) in spite of the Japanese antiaircraft and fighter cover. The bombers were escorted by 16 P-38 Lightnings of 39 Fighter Squadron, which shot down three Japanese A6M Zero fighters attempting to intercept. Kyokusei Maru was hit by at least five bombs, which set off the cargo of munitions and sank the ship. Teiyo Maru and Nojima were also damaged. Kimura refused to retreat, instead detaching Yukikaze and Asagumo to make a high speed run to Lae and deliver 950 survivors from the sunken transport. It was at this point that Kimura made the decision that McAulay (1991) characterizes as having doomed the convoy. Kimura ordered his ships to circle for a time during darkness, so as to time their arrival at Lae for the next morning. All that night, the Allied air units carried out preparations for a mass coordinated strike in the morning, just as they had previously rehearsed. Meanwhile PBY Catalina patrol aircraft continued to track the convoy using their ASV radar and dropping the occasional (and occasionally defective) flare. At 0100 the next morning, 3 March 1943, just as the two destroyers were rejoining the convoy, Kenney threw his Sunday punch. Although the convoy had cover from about 40 A6M Zeros, these were unable to cope with the 16 P-38 Lightnings, 13 Beaufighters, and masses of B-17s, A-20 Havocs, and B-25 Mitchells that came in at three different altitudes: the Lightnings at high altitude to engage the Zeros, the B-17s at medium altitude as they had the day before, and the other aircraft at very low altitude. For the first time, many of the low-level attackers were trained and equipped for skip bombing. Meanwhile, another 38 Allied fighters patrolled over Lae and prevented any Japanese fighters from joining the convoy from that airfield. The Japanese ship captains ignored the Flying Fortresses and turned into the low-level attack, which they assumed was a torpedo attack. This left the ships highly vulnerable to being raked by the machine guns of the Australian Beaufighters, then skip bombed by the A-20s and B-25s. The effect was devastating: 28 of the 37 500-pound bombs dropped by the first wave scored hits, and by the end of the day, all seven remaining transports were sunk or crippled, along with four of the destroyers. Shirayuki was lost early in the attack, when a bomb hit detonated her aft magazine. 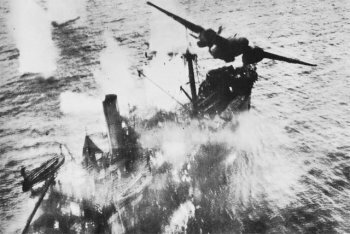 Aiyo Maru suffered two bomb hits that destroyed a boiler and ignited munitions and gasoline, with the fires quickly raging out of control. Oigawa Maru was likewise hit amidships by a bomb that damaged the boilers and ignited fatal fires. Tokitsukaze was crippled by four bomb hits, including a hit in the engine room that her commander mistook for a torpedo hit. Arashio suffered three hits that destroyed her bridge and killed most of her engineering crew, and the ship turned out of control, ramming and crippling Nojima, which had already been hit by at least two bombs. Teiyo Maru was severely damaged by 20mm cannon fire, then crippled by two bomb hits that set off fires in drums of aviation fuel on her stern. Taimei Maru was hit at least three times, including a hit on the bridge by an aircraft that came so close that the suvivors believed it had crashed into the ship. Shinai Maru was also fatally hit near the bridge. Kemb Maru, with its load of volatile fuel, was hit and sank within five minutes. Allied losses were just three Lightnings and two bombers out of 335 aircraft participating in the battle. The Japanese lost 25 aircraft. The crew of one of the Allied bombers that was shot down took to their parachutes, only to be machine gunned by Japanese fighters. This was witnessed by some of the Allied pilots, and the story quickly spread through the air units that night, contributing to the willingness of the pilots to engage in the slaughter that was to come. By 1030 the Allied strike was over. The surviving Japanese destroyers rescued as many survivors as they could, then withdrew at about 1130, except for Asashio. When the Allied aircraft returned at 1500, they found four or five transports and Arashio in a rough line from east to west, all burning, with Asashio to the north rescuing survivors and Tokitsukaze some distance away slowly sinking. The Allied strike was weakened by deteriorating weather, but it was still strong enough to smother Asashio with bomb hits and score additional hits on Arashio, Tokitsukaze, and some of the crippled transports. That night, American PT boats PT-143 and PT-150 finished off the crippled Oigawa Maru, the last of the transports still afloat, while Yukikaze returned to rescue a few more survivors from Arashio. The last of the damaged ships still afloat, Asashio, was scuttled the next day by Japanese aircraft. The Allies reasoned that the survivors could not be permitted to make it to shore to join the Lae garrison; and, since Japanese soldiers did not surrender, they would have to be killed. Thus the morning of 4 March 1943 saw the start of a sickening slaughter of survivors in the water or on boats by aircraft and PT boats. Some pilots, inflamed by the machine gunning of the bomber crew and by other atrocity stories, carried out the mission with enthusiasm; others were repulsed by the slaughter; but none seem to have questioned its necessity. However, some 2734 men were rescued by Japanese destroyers and submarines, and a few hundred others escaped the slaughter to reach shore. At least 300 who landed in Allied territory were killed or captured. One boatload of survivors drifted as far as Guadalcanal, where they were killed by an American patrol. Some 3664 soldiers from 51 Division were lost in the battle. The Allies lost thirteen killed, twelve wounded, and four aircraft shot down. The Japanese decided to risk no more convoys, and turned to barges and submarines to reinforce their garrisons in northeast New Guinea. Carrying 6912 men, 12 antiaircraft guns, 21 artillery pieces, seven large mortars, and 138 vehicles. Equipped with 38 landing craft. DD Asashio Sunk. Carried 150 passengers. Sunk. Carried 150 passengers, including Adachi Hatazo, 18 Army commander. DD Yukikaze Carried 150 passengers, including Nakano Hidemitsu, 51 Division commander. DD Uranami Carried 150 passengers. DD Shikiname Carried 150 passengers. DD Asagumo Carried 29 passengers. Sunk. Carried 1923 passengers and vehicles and equipped with 6 landing craft. Sunk. Carried 1052 passengers, artillery, and aircraft materials and equipped only with ship's boats. Sunk. A "sea truck" carrying 50 passengers and 1650 drums of gasoline. Sunk. Carrying 1324 passengers, artillery and vehicles, and equipped with 8 landing craft. Sunk. Carrying 200 passengers and equipped with 11 landing craft. Sunk. Carrying 1203 passengers, artillery and vehicles, and equipped with 4 landing craft. Sunk. Carrying 252 passengers, 65000 cubic feet (1850 m3) of munitions and provisions, and equipped wth 5 landing craft. Sunk. Carrying provisions and 908 men of the 5 Yokosuka and 2 Maizuru SNLF. Capable of mustering about 40 A6M Zeros for combat air patrol during each of the Navy's half-day shifts. Capable of mustering about 60 Ki-43 "Oscar" for combat air patrol during each of the Army's half-day shifts. B25C-1 Mitchell. Specially modified and trained for skip bombing. A squadron was typically 12 to 15 aircraft.